How Google core ranking algorithm works has always been a mystery. It is even more so when a site’s trustworthiness and credibility get involved. Historically, what we already knew is that Googlebot is not researching author backgrounds expertise – but what about local SEO looking into businesses trust rating and reviews? Answering this question in a recent Google video hangout, John Mueller confirmed with 100% certainty that Google wouldn’t use any third-party trust sites’ ratings or reviews for the core ranking algorithm. But the true question is: is it still worth investing in third-party certificating, rating and reviews? Back in 2017, Google explained that when it comes to ranking factors, they wouldn’t take into consideration trust seals from third-party business or web safe trust sites. Credibility content and trust building icons from third parties never give SEO ranking boost. However, this doesn’t mean that adding trust seals to your website won’t create value to the site and brand in other ways. Trust seals create credibility and authority for brands, giving social and security proof of businesses to their potential users. VWO conducted an A/B test in the past and saw a 32% increase in conversions with E-mark badges visible to site visitors. However, be warned that social proof sometimes may be a failure for certain businesses when bad practices are considered. In a very recent case study, this agency’s client saw an increase in their event ticket sales by around 30% when they removed the social proof element on their page. Their pop-up social proof proved to be hugely distracting users from making a purchase. It is still advisable to keep third-party trust icons on page in a low-profile manner. No evidence was found to justify applying trust seals to your website for a ranking boost. At the end of the day, we’ve been convinced that this will never algorithmically benefit page ranking at all. Is there any chance for SEOs hoping reviews and third-party ratings might benefit ranking, even to a small extent, perhaps to raise more discussions around the brand? This is another story entirely. But what we can say for sure is that if negative sentiments were ever taken into consideration seriously, this site would have tanked massively. What is a BBB score? Better Business Bureau (BBB), established since 1912, directs their services to business and consumers in North America (the United States, Canada and Mexico), with focus on advancing marketplace trust. 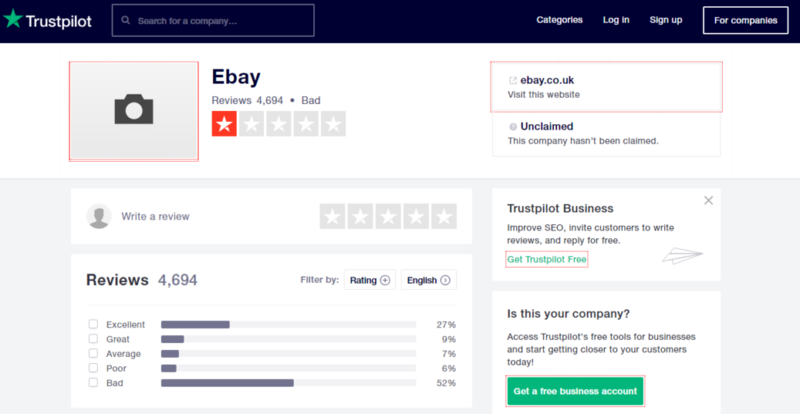 Through complaint resolution and business training, BBB has built a successful relationship between businesses and customers, and therefore the business rating and grading that BBB organises is considered way more authoritative than any other third-party reviewing sites like Yelp.